With the onset of the weekend there is a certain pause that calls us to let go of the burdens and the busy of the week before. We get to sleep a little longer in the morning, walk a little slower through our day, look a little deeper at the same view before us, and listen a little closer to the whisper of the gentle wind that blows over our souls. It speaks of rest and of waiting for the stillness. It inspires a releasing of the stones that weigh us down on our journey. And we need this reminder to yield from the stress that we carry like baggage as we go. Sometimes, we even need to be encouraged that it is ok not to worry, to fret, to struggle so hard against His will for our lives. I realized as I contemplated some hard things this week that, sometimes, I am the one adding the rocks of regret and the boulders of borrowed worry to an already overloaded carry-on-bag. When it comes to the will of God for us, the way may not be easy but the burdens we carry are light because we walk with the Lord. And then, I think of His goodness, of His perfect love, and how there are days… there are moments, too…where He tells us to release the stones we carry. Letting go is a step of faith, that requires obedience and trust, but it is always for our best. 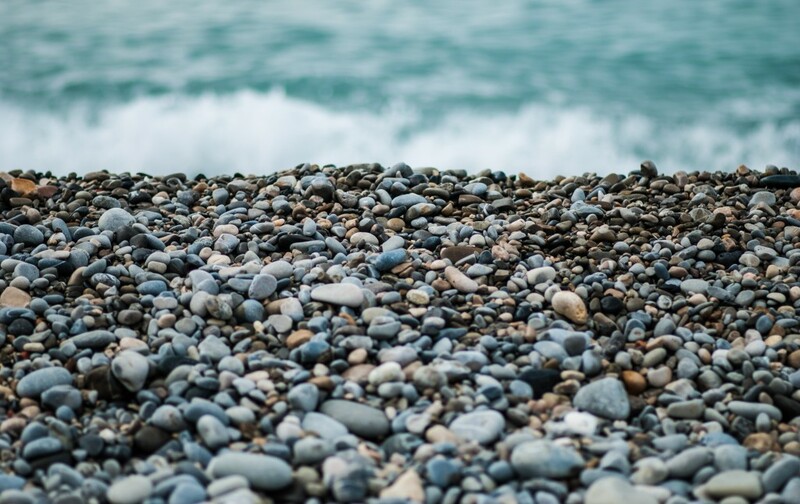 Dropping the rocks we carry into the stream of His love willingly, rather than building altars with them, is part of the sanctification process we all must work through. The releasing of each weight is for our good. The letting go of each burden is necessary to finish the journey. 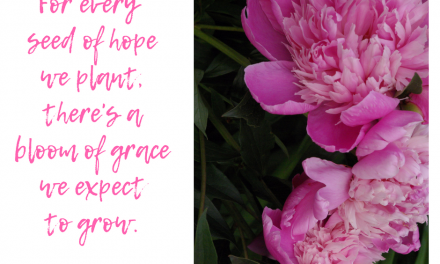 The casting off of each hindrance makes room for hope to thrive and grow. 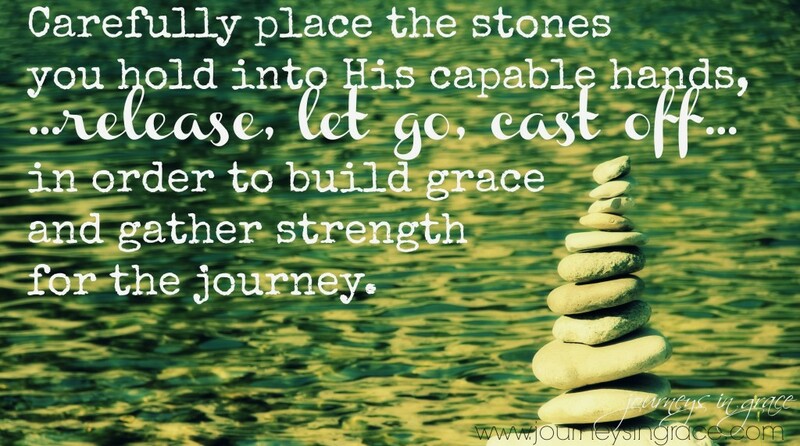 The more we carefully place those stones into His capable hands, as we release, let go and cast off, the more we can begin build grace into our lives and gather strength for the journey. And because He is all three, like the trinity’s example of 3 persons in one God, goodness, faithfulness, and love hinge together purposely. The more we take the time to invest in that truth, to plant it deep into the furrows of our heart, the better yield we will see. Again, the yielding… the waiting… the reaping what was expected because we trusted the seed that was deposited all works together. It is a process. The process is a part of the giving and receiving with God. We give him our stony hearts and He fills us with his fullness. We give him our tattered lives, and he gives us His eternal purposes. We give him our adoration because He gave us His Son. and he that dwells in love dwells in God , and God in him. There is no fear in love; but perfect love casts out all fear; because fear has torment. He that fears is not made perfect in love. The more I found myself choosing to cast out those stones, one by one, in to the ocean of His grace, the lighter my journey became. It didn’t change the situation I felt defeated within, but it changed me and the way I am chose to respond. And sometimes fear of the unknown keeps us holding on to the heavy weights that keeps us dragging. So if we are living in love, if we are filled by His fullness, then letting go becomes easier to do. This 4th chapter of 1 John talks about His faithful love and how we are never left, nor forsaken, when our solid place is God himself. It talks so fully about this encompassing and compassionate love of God; LOVE that changes everything. It isn’t just a story. The Living Word of God is so powerful, that it divides where no surgeon can effectively extricate safely; and it is available to us without restriction or reservation. Because all who come into the fold of His embrace find grace and meet with love’s fullness. I want to learn to know this love, to learn to grasp it so tightly that I begin to see like him. If not a single thing goes through His hands without His knowledge, then why are we worried about picking the burdens up and carrying them ourselves? I began to see, as I wrestled with this casting out fear kind of love, that I want to learn to know, learn to grasp, and learn to live this LOVE that sees beyond. The love that forgives and forgets a wrong and an offence because we can actually see the reason why. This love nailed an innocent Holy Divine to a lifted tree; it bore the weight of the world so that it could extend an open hand to each of us who see it with our hearts. And I wonder if the stones that were being held by mortal hands were burdens being counted, named by lack and loss and misunderstanding. I wonder if these stones we end up picking up to label others and justify ourselves, are the prideful way we explain our reasons for building altars with them rather than releasing them fully into God’s hands. I wonder if the gathering of these stones has replaced the gathering of grace in souls, weighing us down so much that we can’t figure out how to release them in our ignorance. I don’t want to reject true love because I need to be right. This love that Christ had as He hung on Calvary’s Cross is the only freeing love that liberates. His ability to look upon the wounded, those actually wounding Him willingly, and release forgiveness, was because of that deep abiding love. Fully God, fully man…fully enough to pay the penalty for those sins we accumulate, and full of the perfect love that casts out fear. Love that leads us to drop stones and pick up crosses and follow Him. And so, I want to purpose towards that deep and perfect love that seeks forgiveness for the souls of those who hurt us rather than build us. Because perfected love hung on a cross a tree of nails and names, and still loved with a perfect love that was able to see the fullness of time in a fraction of a second. Christ had the compassion to love on all those who sought his demise with a mercy that is supernatural and a hope that is limitless. We can know that. We can experience it. Even when it feels like the walls are closing in. Trust that you are beloved by God. • Don’t build altars in your mind, heart, or your living that keep you from being tenderhearted before the King. • Build a prayer bench, get close to the King, and let him deconstruct those broken walls. • Walk wisely by spending yourself in the Word, and submit willingly to the call He has placed close to your heart. • Be diligent to give up everything… including the stones weighing you down so that you can be ready to pick up the cross He calls you to carry. When Jesus rode into Jerusalem on the donkey, he entered through an arch of hosanna praises. He was literally being asked to save and deliver those who recognized Him as the Messiah. Friends, I am praying that for you today. Deliverance from the literal stones that you were never meant to carry. I am praying for every heart that reads these words this week. For each one who needs a little courage to let those stones fall from their hands, you are covered by His mercy and grace. Summary Learning about the art of releasing our struggles by visually seeing them as rocks we drop into the perfect love that He has provided for us to fill us and restore every wound our hearts carry. Such a beautiful post full of truth–loved the part about trust & not building altars in our minds. Thank you! Thank you Angela! I am so glad you were here and shared a bit of grace with me. Blessings! A beautiful post, Dawn. May we each be willing to lay those stones down & build an altar at the foot of the Cross. Blessings! Amen! Praying that prayer with you Joanne! So glad to see you! The image you created between laying rocks down instead of building alters was beautiful. I’ve never made the connection before. I understood each aspect individually, but putting them together brings it to a new level of understanding. Thank you for sharing! There are so many of those little things that connect us to truth in ways we never quite saw their tie, Becky, and I am amazed, all too often, at how much I miss them. I am so thankful for His grace and the way He teaches us to lay down the things that are never meant for us to carry right into His hands. The freedom is overwhelming. What a precious post, Dawn. I am so grateful that we can come to Jesus and drop it all at His feet and know that He loves us so much. Our burdens are never too heavy for Him to carry, no matter how weighted down we are. So thankful to meet you and to receive your encouraging comment at my blog. God bless you and yours with a wonderful Easter! Thanks Cheryl!! I am always happy to see friends who share the same heartfelt passion of seeking to be at the foot of the Cross with me. Blessings and Happy Easter to you as well! He truly is that safe place to cast our cares – and know that He willingly receives them. That process of letting go and trusting Him can be hard, but He rewards our trust with increased faith, and that’s beautiful to behold. Lovely words, Dawn. I am so thankful he is that safe place and in Him we can find true joy and hope as we let go of the things we ‘think’ we need to hold on to. So many of the things we think we need are but trivial pebbles in comparison to latching on to His boulders of truth. Glad you were here for a bit. I know what you mean, Irina. Carrying the stones seems familiar and letting go seems foreign. I am so glad that He is in control and He knows the best way for us to walk. He has the perspective of sovereign sight and can lead because He loves us… so we can trust him. 🙂 So glad you were here and thankful for your kind words each week. Thanks friend! 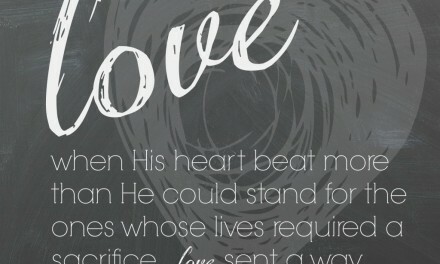 No matter what happens we need to remind ourselves of this: “God is love. God is good. God is faithful.” Sometimes we hang onto the stones we need to let go. May God help us to trust Him through it all. Blessings! I’m visiting from #ThoughtProvokingThursday. Grateful you were here, Gayle. It is all about trust, isn’t it? Trusting Him enough to know better than we do what is best for us. This statement grabbed me: “I wanted to cast stones this week, but not into His hands. I wanted to lay them out and look at them” …because it’s where I’ve been lately, too. Needing to let myself release these burdens to His care and realize they’re not my responsibility. Thank you for the reminder. There’s an island off the coast here in Maine on which one of the beaches has nothing but perfectly smoothed orbs of rock. They are beautiful and your words today bring them to mind because dropping our heavy stones into the pool of His love relieves us of the weight — and we never know what beauty He will bring! Just today I was thinking of a regret – a heavy stone – I’m struggling to cast out. I know I must and I know The Lord has already forgiven me. It’s the forgiveness of self that keeps me walking with the extra weight. Thank you for sharing this! Happy Easter!